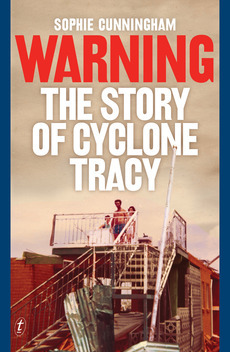 I was alone in the house last Saturday when I began reading Sophie Cunningham’s Warning, The Story of Cyclone Tracy, and a windstorm was brewing. It was gusting up to almost 60km/h, which is 7 on the Beaufort scale, almost a gale. I went outside and did the usual things that I do when the weather seems ominous, stacking outdoor chairs away and tucking the cast-iron table upside-down under the shrubs at the back of the house. I was very conscious that short of evacuating the city altogether, nothing much the residents of Darwin could have done would have made any difference when in 1974 the city was hit by a cyclone packing 217 km/h before the anemometer ceased functioning. You only have to look at this video to see the destruction. These are the bare bones of it: around midnight on Christmas Eve, 1974, a cyclone hit Darwin. Around seventy-one people died, hundreds more were injured and seventy per cent of the homes of Darwin’s 47,000 inhabitants were laid waste. That left only five hundred residences habitable out of some twelve thousand. Every single public building was destroyed or seriously damaged. While the loss of life was limited, the material damage was unparalleled. The population of Darwin endured winds that some believe reached speeds of three hundred kilometres per hour. In the week after Tracy, close to thirty thousand people were airlifted out of the ruined town in what remains Australia’s largest evacuation effort. Many of them never returned. The damage bill was estimated at between 800 million and 1.5 billion dollars, which is the equivalent of 6.1 billion today. This, set against the town’s relatively small population means it still ranks as one of the world’s most costly disasters. At its worst, parents were not able to protect their children at all. What I did not know until I read this book was that the evacuees were packed into military planes like sardines, with no toilet facilities. I did not know that families were separated because in the chaos, that people were simply bundled onto planes without a manifest. Indigenous people for whom connection to land is a spiritual necessity were packed off to places that were as foreign to them as China would be to me, and they were not necessarily made welcome. I did not realise that the urgency to evacuate was because there just wasn’t any food, or water, to sustain the population in Darwin. There were no communications. For quite some time, the people of Darwin did not know if the rest of Australia had heard about their plight. 1974 doesn’t seem like such a very long time ago, yet the authorities’ attitudes to women were closer to those of the 19th century than our own. Cunningham points out that it was never even contemplated that women might contribute anything to the relief effort. Priority for evacuation was given to the sick, injured and pregnant, then women and children, and elderly couples, married couples and single people after that. By December 31st, there was only 5-10% of Darwin’s women left in town. Not all of them had wanted to go. When Howard Truran was interviewed about his experience fourteen years after the event he still remembers that, although he wanted his wife and kids evacuated because he was so worried for them, the experience was extremely traumatic. My dear friends – an engineer and his wife with a [then] young family – were caught in Cyclone Tracy and they paint extraordinary pictures with their reminiscences. One that often stays with me is how they felt, these two recently-arrived poms with their two tiny daughters, upon seeing the devastation of their home. Almost everything was taken up by the wind and lashed into pieces many miles away but, there, upturned in amongst the rubble, was one delicate sherry glass they had brought with them from the mother land, a precious wedding gift of fine crystal, sitting proudly on its stem, completely unscathed. I imagine it like a miniature trophy, a monument to their survival. They now live in Tasmania which, short of returning to England, is about as opposite to Darwin as you can get. I have been inside a little room in a Darwin museum where, in pitch black, you can hear the sound of Tracey. That little piece of history gives a tiny insight into the terror. Hi Karenlee, what a beautiful story:) It is amazing the odd little things that survive… I helped to clean up a house that had been destroyed by fire, and there were little pieces of porcelain from a wedding present dinner service that we were able to carefully clean, yes, a small symbols of survival. But my discovery of the museum online and Sophie Cunningham’s thoughts about the coming 40th anniversary and possible commemorations reminded me strongly of Andrea Goldsmith’s The Memory Trap. By the sound of it the Tracy museum would be what she called an ‘experiential’ memorial, and I wonder how people who lived through it view this concept? Yes good question … Probably varied, like most things. As for climate I’d say Darwin in July is way more comfortable than Singapore. Darwin has the same average maximum as Singapore, ie around 30.5°C but Singapore’s humidity is around 83% and Darwin’s 38%. That makes a huge difference in comfort, to me, anyhow … Sure we’ve felt hot in the Top End in July but I’ve never dreaded going out the way I did in Singapore. It’s that sense of having a shower and knowing that within an hour or so the freshness will be gone and your clothes sticking to you. I hated that. Oh, me too. Tropical climates are not for me. But I find Sydney’s humidity hard to bear, and the Gold Coast’s. It’s my English genes! I don’t like humidity either — now Canberra, we are definitely NOT humid here! I am an inland or mediterranean girl I’ve worked out. Oh yes, Sue, that café overlooking the beach! I had forgotten about it. It was wonderful. Yes, I think it’s called Cornucopia. It’s gorgeous isn’t it – the blue green sea, the pandanus.